Sorting and documenting more archives from the DPW Museum. January 24, 1884 Letter from the office of J.E. 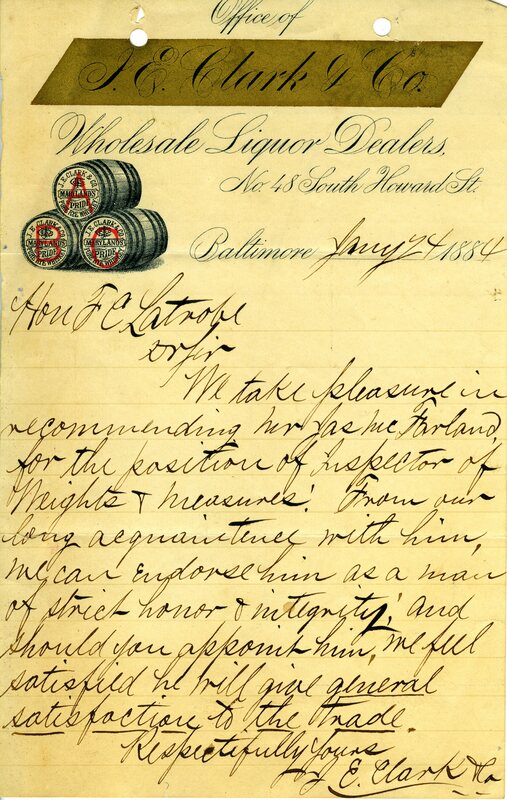 Clark & Co., Wholesale Liquor Dealers, No. 48 S. Howard St. Baltimore to Hon (Honorable) (Mayor) F.E. Latrobe: Dr. (Dear) Sir, We take pleasure in recommending hon (honorable) Jas. McFarland for the position of Inspector of Weights and Measures! From our long acquaintance with him, we can endorse him as a man of strict honor & integrity and should you appoint him, we feel satisfied he will give general satisfaction to the trade. 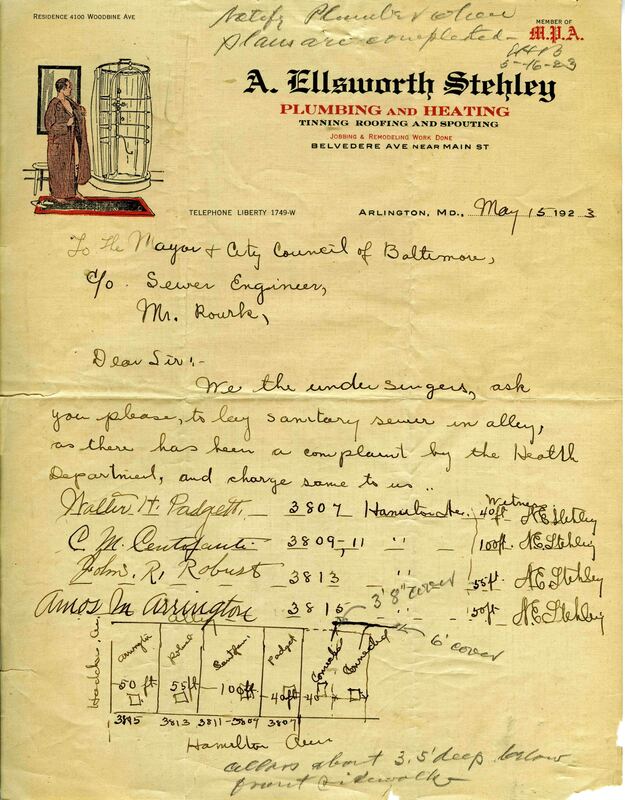 Respectfully Yours J. E. Clark & Co.
May 15, 1923 Letter from Stehley Plumbing to the Mayor and the sewerage engineer Ruark asking for a sanitary sewer in the alley, houses along Hamilton Ave. and ? (Where Remmell Ave. is now)(Not sure if initials in upper right are Mayor Broening’s? Note says to notify plumber when plans are completed). I looked on a few maps and still cannot find the name of the intersection that 3815 Hamilton Ave. was at back then. Someone once asked me when did Northeast Baltimore get a sewer system? It was about this time. 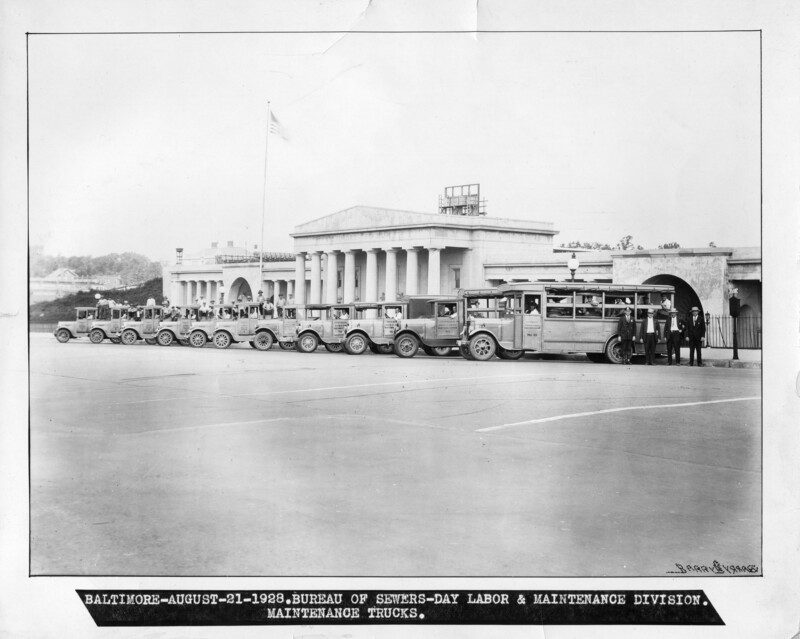 A photo I posted on Facebook a couple years ago, showing Sewerage Maintenance trucks and workers back in 1928, parked in front of the Baltimore Stadium. Democrats doing the Hip-Hop back in 1900! 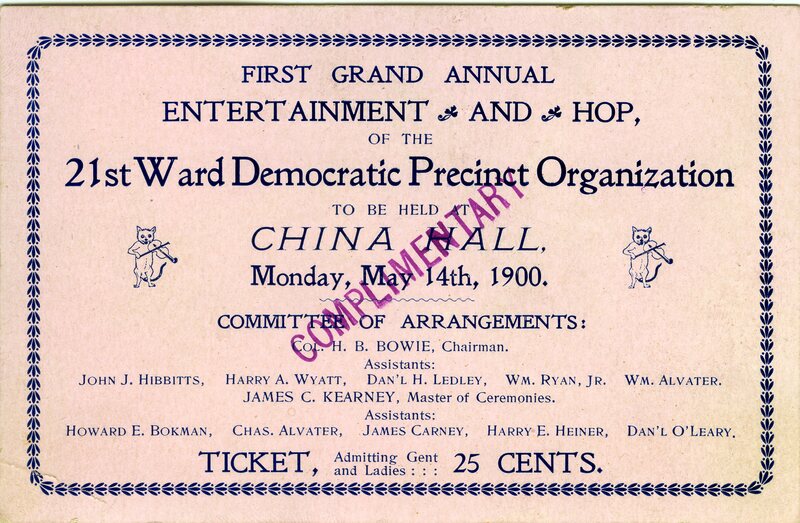 I looked up the 21st District to see where the China Hall was located. Found China Alley but no Hall.